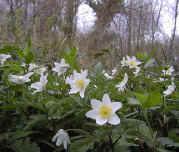 Lists of plant species which favour ancient woodland sites in particular geographical areas of Britain have been compiled by ecologists. By assessing the number of these species present in a particular wood, an educated guess can be made as to whether it is an ancient woodland site or not. Indicator species are useful tools, but the lists need to be used with caution and only those applicable to a particular area should be used in that area. Certain woodlands can credibly be established as being 'ancient' through the study of old historical records such as maps and estate records. Observations of landscape features such as banks, ditches and other topographical features within a wood will also give clues to previous land use. By surveying a number of these 'proven' ancient woodlands, species which are usually confined to this type of habitat can be identified. Their presence can then be used to indicate ancient woodland status in other less well-documented woodlands. The indicator species chosen are commonly plants rather than animals. This is because plants are usually conspicuous, relatively easy to identify and do not hide or absent themselves when humans are present! Most Ancient Woodland Indicator Species lists are based on vascular plants (flowering plants, native conifers and ferns). These species are known as Ancient Woodland Vascular Plants (AWVP). AWVP scores (the number of these species present at a particular site) are frequently considered in conservation work. Indicator species lists have also been constructed for some areas using Bryophytes (mosses) and epiphytic lichens (those which grow on trees). These lists of species provide extremely useful tools for ecologists and conservationists in evaluating woodland habitats. However, they do need to be used with a degree of caution. Lists of indicator species will vary according to geographical location. This means that lists specifically worked out for a geographical area, such as the Southwest of England, must be consulted if one is surveying in Devon. A list compiled in Lincolnshire, for example, may give completely erroneous results in other areas of the country. This is because local geology, soils, climate and history of land use will all influence the plant species present and their ecological distribution. For example, Hay-scented Buckler Fern, which is restricted to woodland in certain areas, is much more common and widespread in mild, wet southwestern counties. It is therefore of less use as an indicator in these regions. In addition, the presence of a few relevant indicator species does not mean that a woodland should be designated as 'ancient'. In general, the greater the number of Ancient Woodland Indicator species occurring together in a wood, the greater the probability that a woodland can be accorded this status. Below a certain minimum number of species, few conclusions can be drawn. They seldom occur outside woodland or, if they do, they indicate long continuity of woodland cover. They are capable of growing in shade, although not necessarily only in shade. They seem to be reliable indicators in at least part of the region under survey. A high AWVP score is a reliable indication of natural diversity. It also indicates ancient woodland, but does not on its own constitute proof. Some woods which are undoubtedly ancient have a low AWVP score. Study of other components of the woodland biodiversity such as lichens, or invertebrates in rotting wood, may give clearer indications of ancient woodland status. Quite often, ancient sites that are rich in AWVP's will be poor in lichens and rotting wood invertebrates and vice-versa. Indices are also available based on epiphytic lichens. 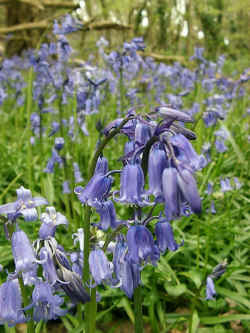 There are about 30 species which are used as Ancient Woodland Indicators. These can only be used where air pollution is not a problem and the trees are sufficiently large for a diverse lichen community to grow on. This type of list can be particularly useful in pasture woodland with open glades. Individual species should not be used solely to indicate ancient woodland status. High AWVP scores are good indications of an ancient woodland site, but are not proof on their own. They can however, be used to provide levels of probability that a site is ancient. Not all indicator species are strictly limited to ancient woodlands. For example, where secondary woodland adjoins older woodland, it will acquire species associated with older woods much more quickly than isolated secondary woods. Some plants tolerant of a wide range of ecological conditions will behave differently on different soil types. They may be suitable indicators of ancient woodland on one soil type, but not on another. Plants which are also cultivated in gardens (e.g. 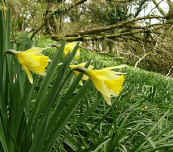 Wild Daffodil) should be used with great caution. The development of indicator lists for particular areas may involve so much work in initially identifying credible ancient woodland sites from records, that the list is no longer required!